This was my sixth year of the Mason 5K race. I only do this one race a year and started training for it 6-7 weeks ago. While in previous years I had been working in the gym fairly continuously (and was therefore better prepared) I was, at least, better prepared than last year, when I had my worst time ever. My two goals this years were (1) to finish the race and (2) to better last year's time. I can report that I did succeed on both counts, though my time was still considerably slower than my first four years. At least my preparations also helped achieve a weight loss, which I am still pursuing. My doctor approves. My times for all six years are displayed at the bottom of this page. All my photos this year were taken with the iPhone 6 Plus. This phone camera gets good reviews and has a very clever and useful panorama feature. You may note some strange distortions in the panoramas due to subject movement during the panning of the camera. The first photo was my first view of the race track immediately after the start line before the race started. The next two photos show the participants waiting for the starting signal. The first shot shows the participants still waiting while the next two show them moving out after the starting signal. The third shot shows me just past the finish line after the end of the race ... perhaps you can see the fatigue in my face. More photos following the finish of the race. At intervals the race organizers printed out the times of those who had finished. There was great interest to see the standings in all the age groups. The last photo shows the page with the Men 70 and up times (my group). This panorama shows the starting line just before the start of the race. This panorama shows the participants waiting for the start of the race. You can see some of the distortion caused by the movement of people during the scanning of the camera. Note the girl (number 348) and the boy in the foreground with his back to the camera. The scene at the end of the race. 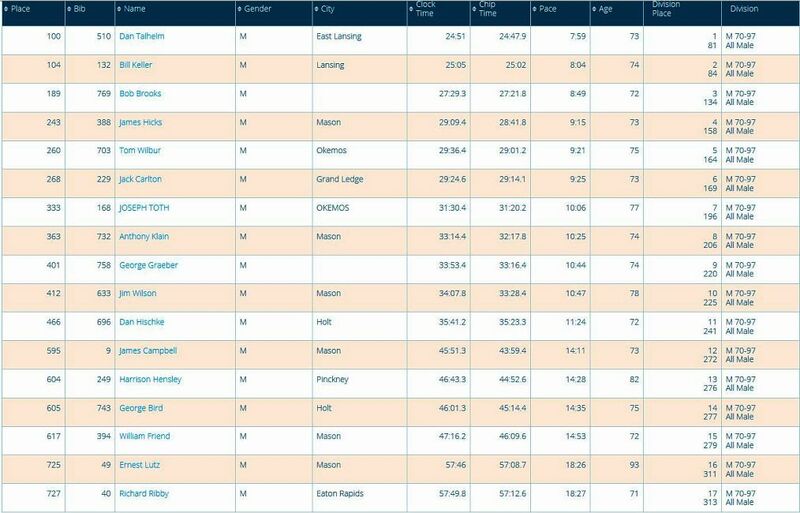 A screen shot of the race web page showing the final results for the Men's 70 and up group is shown below. I'm listed in 12th position (out of 17 participants) as James Campbell. Click on the listing for a larger version that is readable. The "chip time" is the time for each participant from when he crossed the start line to when he crossed the finish line.